Walmajarri man Murungkurr Terry Murray lived on Cherrabun Station in a tin shelter when he was a child. His family had no vehicle so they went hunting on foot. Murungkurr has a strong grounding in bush skills, which he learnt from his parents. 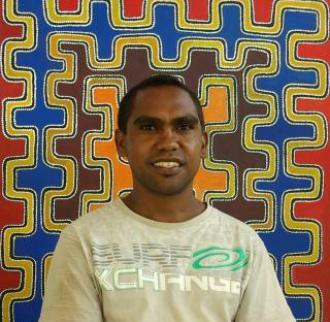 He paints his jaja [grandfather] and japi’s [grandmother’s] country, Wirnpa and Japingka in the southwestern side of the Great Sandy Desert. This area is known as jila [permanent waterhole] country. His mother and brothers lived around there when they were kids. Murungkurr has strong family connections to a significant group of Mangkaja Arts artists and knows his law and family relationships through his skin group. He explains, “Our culture is an everyday learning thing. I grew up with this. You have to have a strong mind and strong spirit and soul and always listen to your elders”.